Start Loon Lake Chalet at Loon Lake. From Highway 50 turn north onto Ice House Road. Drive 24 miles to the intersection where you must turn right to stay on Ice House Road. Turn right and continue for 5.3 miles until you reach the Loon Lake Chalet. This very short tour to Berts Lake and Peak 6836 is an excellent choice for skiers who want to experience a tour of intermediate difficulty for the first time. The views from along the route are exceptional with the highlights being Chipmunk Bluff, Tells Peak and the Crystal Range, and of course moonscape-like Loon Lake. When you are blessed with powder snow, which unfortunately doesn't last long because of the relatively low elevation of this area, or more likely corn-snow, instead of retracing the route back to the trailhead you can descend down the steeper slopes on the north side of the peak and intersect the route you skied up. The terrain is perfect for carving telemark turns. A second alternative return route is to descend from Berts Lake to Chipmunk Bluff road as described in the Berts Lake and Chipmunk Loop tour. There are two trailheads adjacent to the Loon Lake Chalet. 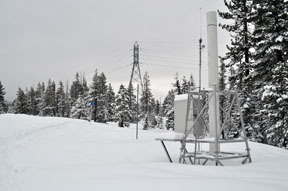 The trailhead for Berts Lake is located at the SMUD rain gauge on the southwest side of the the Chalet. From the trailhead (1) ski southeast a short distance toward the nearby power lines and before reaching them turn and ski southwest for a total of 0.2 mile until you reach the point where the marked trail crosses under the power lines (2). This point is at the base of a steep rise. Ski slightly east of south for 0.1 mile until the marked trail reaches the edge of an open area (3). Ski southeast through open and near level terrain for 0.1 mile until you reach the location where a blue diamond marks where the trail enters the woods again (4). If you are lucky the El Dorado Nordic Ski Patrol has placed a couple of posts with blue diamond markers in the open area; look for them. 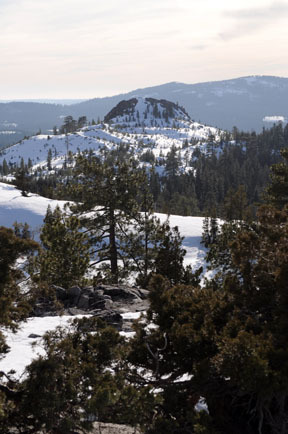 If no markers are visible, ski southeast through the open area being careful not to gain very much elevation. Traverse around Peak 6836 for 0.7 mile until you reach Berts Lake (5). The marked trail in this section stays level until it is east of the peak and then climbs. Climb northeast for 0.1 mile until you reach the Peak 6836 (6). Retrace the route for 1.2 miles back to the trailhead (1). As an alternative, follow the route described below. Descend north for 0.1 mile until you intersect the trail to Berts Lake (approximately at mileage point 4). Retrace the route for 0.4 mile back to the trailhead (1).